Since I am in the midst of editing Awakening A Witch, my paranormal, historical romance set in Scotland, I thought it'd be appropriate to post a photo from the land of kilts and bagpipes today. 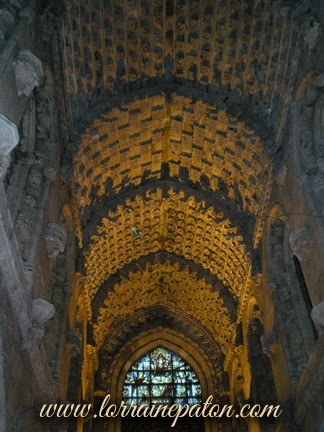 When we were in Scotland a few years ago, we visited Rosslyn Chapel (yes, the Rosslyn Chapel that Dan Brown wrote about) - it was absolutely amazing! i did enjoy Dan Brown's books. I imagine it was very exciting to visit the chapel and recognize it. Your new book sounds fascinating. Great title and a beautiful photo. Thanks. Today I'm on Victoria Smith's Blog!